Most low-profile leafy vegetables & herbs including arugula, kale, spinach, mache, basil, and baby lettuces. 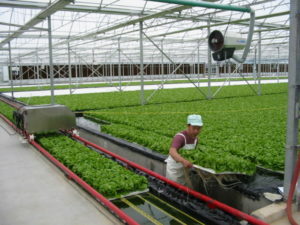 Hydronov is the developer of a revolutionary growing technique, Floating Raft Technology (FRT), for vegetables and flowers. 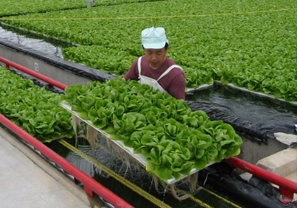 Floating Raft Technology (FRT) is the most water-conscious system among existing hydroponic growing systems. One of its key features is the use of a large volume of water, allowing a buffer for fertilization and oxygen control, as well as using flotation to economically transport the plants. This large buffer brings a level of security and ease that no other growing system can match. With FRT, absolutely no water is lost through the soil or growing media. There is no direct evaporation by the sun, no dumping of growing solution, and no dripping gutters. Only the water needed by the plants is used, making FRT the most economical system in terms of water use. FRT leads to much higher productivity. With FRT, up to 18 crops per year of single head lettuce can be grown, at an average head weight of 200 grams. In comparison, the best soil-based greenhouse growers can only produce five crops per year. No herbicides or fungicides are ever needed. Hydronov has also developed the first organic solution for the FRT system. FRT provides an integrated Harvest Transportation System within the facility, simply by using the growing water as a conveyor system. Conveyors transport the harvested lettuce into a service building, where it is packed per customer specifications and kept in cold storage until pick up. Our FRT boards are available for purchase. 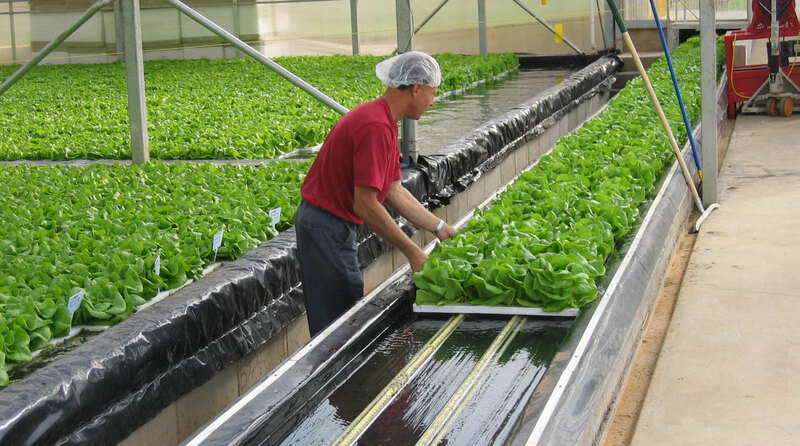 In a change from traditional greenhouse operations, Hydronov’s Floating Raft Technology (FRT) allows the produce to move smoothly and easily from seeding to harvest. The produce moves to the greenhouse employees, allowing them to stay at their workstations. The crop comes right to them! The produce moves throughout the facility on the floating rafts, eliminating the costs associated with mechanical conveyors. Our specially designed equipment facilitates processing at different growing stages. The end result: an efficient growing process performed by a reduced crew. We estimate 5-15 people per hectare, depending on the type of produce grown and the type of packaging. Visit our greenhouse equipment sales page.